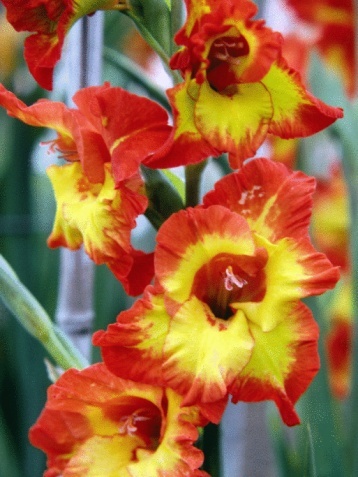 Gladiolas, familiarly known as "glads," grow from bulb-like structures called corms. The corms are cold tender and won't tolerate winters in U.S. Department of Agriculture zones 7 and below. 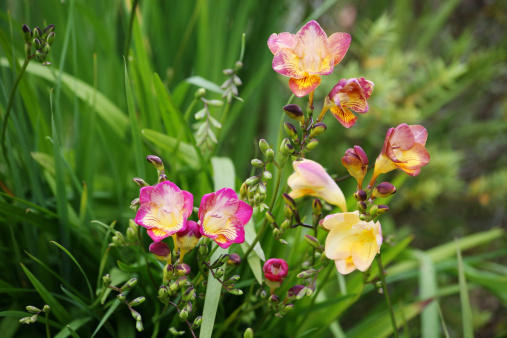 Although some gardeners prefer to grow glads as annuals and plant fresh bulbs every year, it isn't difficult to preserve the bulbs by digging them every autumn. 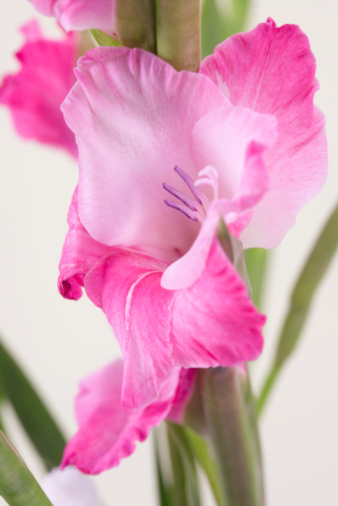 Gladiolus are available in every color except true blue. Dig gladiolus corms before the first hard freeze in autumn, but not until the foliage dies down after a light frost. Leave the corms in the ground as long as possible, as the green foliage absorbs sunlight, which provides energy and food to produce next year's blooms. Without the foliage, flower production will be weakened. Use a spade or garden shovel to loosen the soil around the clump, then hold the tops and pull the plant carefully from the ground. Shake the clump to remove excess soil from the corms. Use garden shears to cut the foliage 1 to 2 inches above the corm. Spread the corms on a newspaper, not touching, in a warm, dry, well-ventilated place to cure for two to three weeks. After the corms have cured, last year's corms will be noticeably dry and shriveled. Remove the old corms by twisting them, then discard them. Save the new corms with husks intact. Place the gladiolus corms in cloth bags, mesh onion bags, paper sacks or in the legs of old nylon pantyhose. Store the corms in a dark, dry, cold, well-ventilated place such as a shed, garage or basement. Although temperatures should be cold, the corms should never be allowed to freeze. The storage room should be between 35 and 45 degrees Fahrenheit. 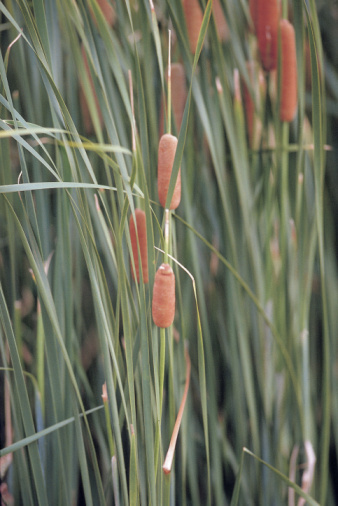 Replant the corms between May and mid-June. Although it isn't necessary to dig gladiolus corms in the milder winter climates of zone 7 and above, a 3- to 4-inch layer of loose mulch such as straw, dry leaves or pine needles will keep the soil moist throughout the winter as it offers protection from light frosts or temperature fluctuations. Remove the mulch when the weather warms in spring.